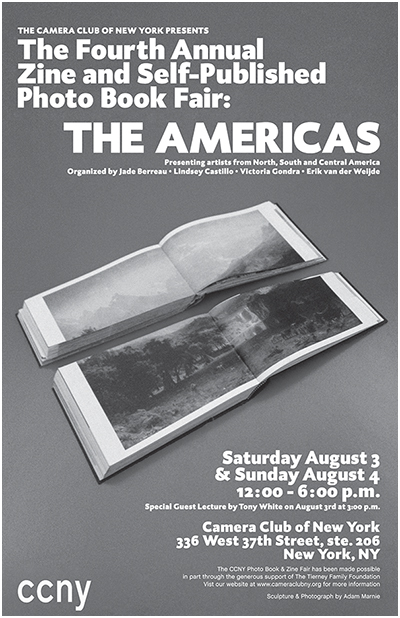 The Fourth Annual Zine and Self-Published Photo Book Fair The Americas: Presenting artists from North, South, & Central America Organized by Jade Berreau, Lindsey Castillo, Victoria Gondra, & Erik van der Weijde Saturday, August 3 & Sunday, August 4, 12-6pm at CCNY Special Guest Lecture: Tony White Saturday, August 3, 3pm The Camera Club of New York will host the fourth annual Zine and Self-Published Photo Book Fair, Saturday and Sunday, August 3 and 4, 2013. 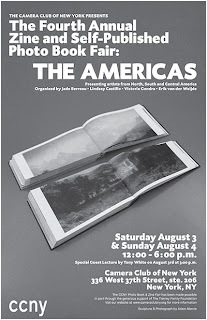 This year’s theme, The Americas, presents photo books and zines from North, South and Central America. The curators – Jade Berreau, Lindsey Castillo, Victoria Gondra and Erik van der Weijde – each have backgrounds in publishing, with close ties to artists from all over the Americas. They have curated a wide range of work that reflects the region’s great diversity in art and culture. As in past years, all proceeds from the sale of zines and photo books will go directly to the artists or small publishers.